Dr. Barker and 32 Pearls Family Dentistry celebrate over 8 years in Michiana! Dr. Barker put a lot of thought into the design of her dental practice in Granger. Her goals included being family friendly, inviting, efficient and up to date. She was able to achieve her desired look for the office, that helps put patients and their families at ease. Dr.Barker loves staying updated with the latest techniques, the most state of the art equipment and technology. The office goal is to provide quality treatment in the most relaxing environment possible. Her dedication to both the dental profession and education gave her the motivation to open an independent office. 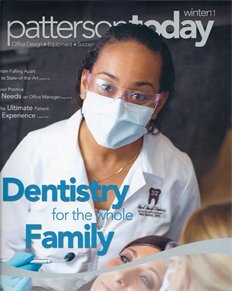 Her desire for state of the art equipment and passion to give back to the community landed her a feature cover story in a very well known dental magazine, PATTERSON TODAY, shortly after opening in 2010. Since then, the office has grown and so has her family. Dr.Avis Barker is originally from Southern California. She received her Bachelor's of Science degree from Purdue University, West Lafayette (2003). She completed her dental education and training at the prestigious, Tufts University School of Dental Medicine in Boston, MA (2007). Dr.Barker has made Granger, Indiana home for her family and "32 Pearls Family Dentistry". She is an active member in many dental organizations: American Dental Association (ADA), Indiana Dental Association (IDA), North Central Dental Society (NCDS), Chicago Dental Society (CDS), Mishawaka Dental Society and the 3rd Coast Study Group. She is licensed in the states of Indiana (active) and California (active), requiring many extensive hours of continuing education. Dr. Barker actively serves Michiana by volunteering her services, education and time to non-profit organizations to help strengthen the community. Dr. Barker has given lectures and served as a keynote speaker for events and non-profit organizations. She travels overseas, volunteering on mission trips, sponsors public broadcasting and the local community schools. Dr.Barker also volunteers her time assisting the federal government and law enforcement with dental forensics. In her spare time she spends time with her family and is a volunteer assistant track and field coach for a local school. Dr. Barker has a genuine heart and respect for her staff and patients. She plans on practicing dentistry in this community into her VERY DISTANT retirement! Dr. Barker and the 32 Pearls Staff sincerely welcome you, as we do family, to your new dental home.